During the summer I love spending my days outside with the beautiful weather and sunshine. While enjoying different outdoor activities such as canoeing, jogging and biking, I always have to make sure I am protecting my skin. Sunburn is very common regardless of complexion and is very easy to acquire. It’s as simple as sitting out in your backyard in a beach chair tanning without applying sunscreen. The next thing you know, your body is red, irritated and burning. With the recent heat waves Michigan has been experiencing, it’s extremely important to take precaution while outside for long periods of time. Try these tips in order to keep your body safe and healthy throughout the summer! Protect Your Skin: The sun’s rays are at their peak between 10:00am-4:00pm, it is best to steer clear of sunlight during those periods of time. Wear Protective Clothing: While in the sun, it is important to wear clothing that protects your skin. Try to wear darker colored clothing because it offers more protection than light colored clothing. Remember, if you are feeling overheated move out of the sunlight and into the shade to cool down. Apply Sunscreen: While in the sun it is very important to apply sunscreen. Sunscreens are rated according to their effectiveness by the sun protection factor (SPF). A product’s SPF number helps determine how long the product will protect you before you need to re-apply it. Sunscreen with a SPF of 15 or higher will suffice. Wear Hats: To keep the sunlight from directly hitting your skin, wear a wide-brimmed hat to cast shade onto your face. Don’t forget about your lips: During the summer most people only think of protecting their skin from sunburn. Well, that’s not the only part of your body that needs protection. Your lips are also very sensitive to the sunlight, so when you buy chap-stick check and make sure that it says it has SPF in it. This will protect your lips from being sunburned and keep them from staying chapped. 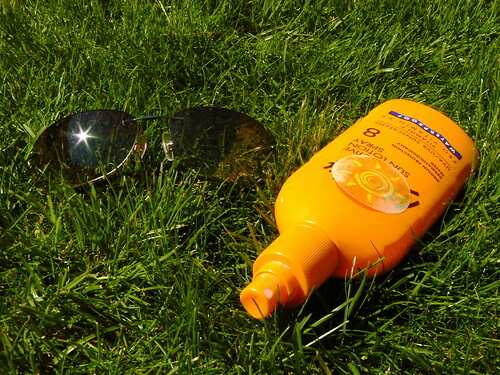 Have Sunglasses Handy: Protecting your eyes during the summer is imperative to your health. According to Fox News, cancer around the eyelids is more common than people think, so sunglasses should be worn whenever you are outside. The sun’s UV radiation can cause damage to the eyes such as cataracts, benign growths on the eye’s surface and photokeratitis sometimes called snow blindness, which is a temporary, but painful sunburn of the eye’s surface. Whether you’re gardening or having fun at the beach, there are multiple ways to stay healthy in the sun! For even more tips to protect yourself from sunburn this summer check out this video by our very own health guru, Grace Derocha. What ways do you keep your skin healthy from the sun?